Collaboration, Cardboard and Coding - Computational Creatures 3.2 — Wonderful Idea Co. 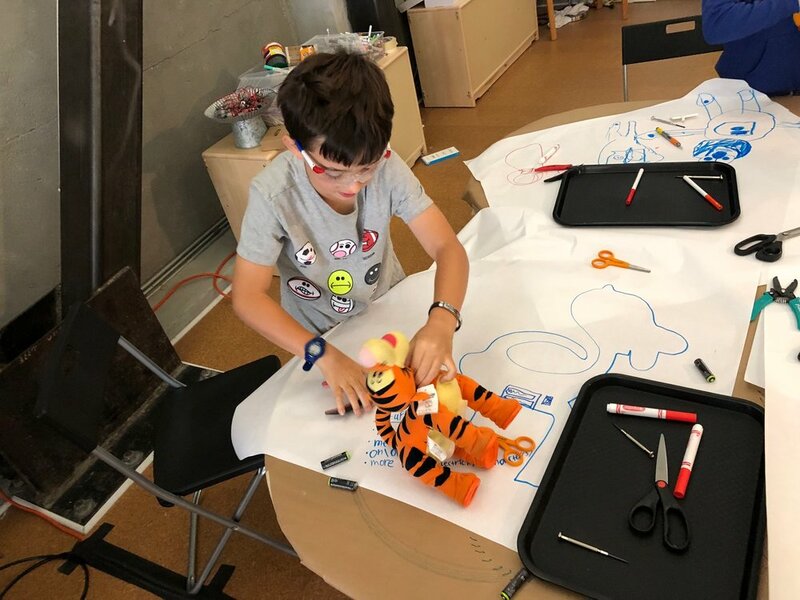 The second day of computatational creatures summer camp was super busy and really fun as we explored high and low tech tools and materials. We started the day with a dissection activity where campers worked in pairs to carefully observe the parts of singing and dancing toys, used many different tools to take them apart and then drew & catalouged the parts that they discovered inside. There was a lot of great collaboration between the pairs as they made a plan about how to dissect the toys and debated the purposes of all the elements. During the activity we noticed how laughter or excited shouts drew together small groups when there was an especially interesting or surprising discovery. There were direct connections to the art machines activities that we experimented with yesterday. 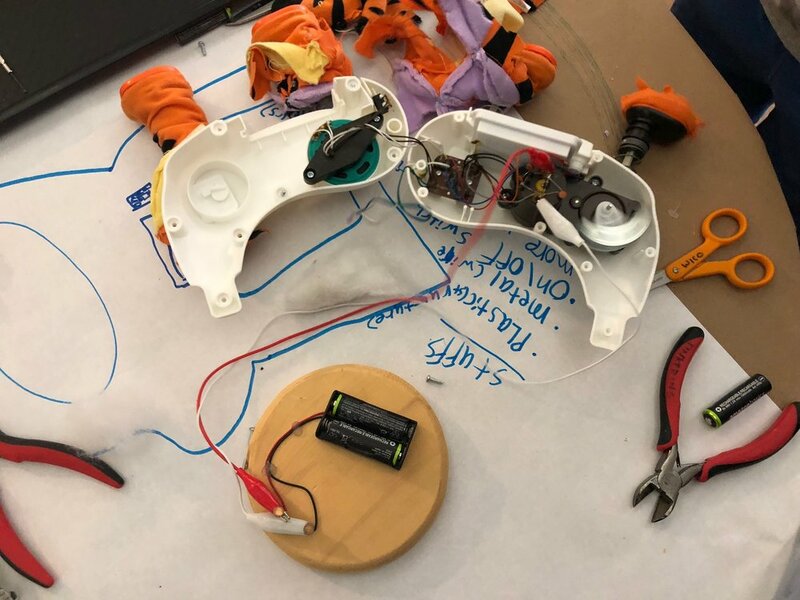 All of the toys used the same hobby motor to power the mechanisms and one group found a really cool off-set weight that gave a Tiger an erratic shaking motion. Campers found complicated linkages, circuit boards to control all the parts and interesting switches that triggered the movements. For the second part of the day we split up into two groups to explore cardboard automata and micro:bit & motobit. After seeing both the mechanisms and the programmed controllers in the dissected toys, these two activities gave us a chance to create with similar elements. In the micro:bit section of the workshop we started by getting the LED screen to say our names and make other animations. We experimented with several different types of inputs including the on board buttons, the shake function and the free fall feature. 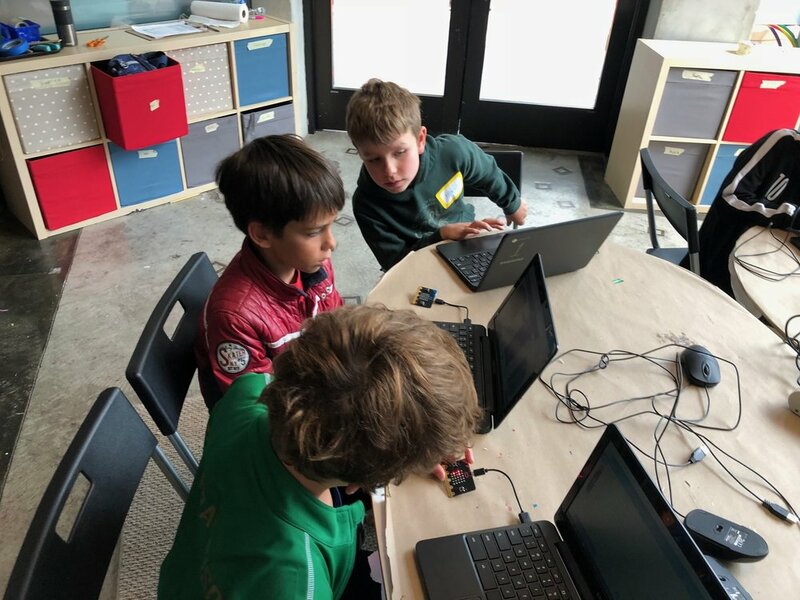 For the second half of the workshop campers experimented by connecting the moto:bit and controlling DAGU motors speed, direction and pattern. Some of the campers extended the wires and made moving creatures that skipped across the floor. In the meantime, the other half of the group experimented with building cardboard automata from the starting point of the Fire the Inventor kit of parts. There were some really awesome ideas explored in this activity. There was a lot of really cool story telling with the creations that people built in this activity. It was really fun to see this earthquake simulator that demonstrated a 5.0 temblor. Others made some really complex and artistic projects and there were even LEDs added to some of the automata. In the afternoon, the groups switched places so that everyone had the chance to experiment with both activities. And at the end of the day we spent fifteen minutes writing/drawing in our journals about similarities between the activities and outstanding questions for the rest of the week.